Data modeling is actively applied in analysis and uses wide set of methods for description the data requirements in a system. One of the most popular and well-known is the ERD method of database modeling, which lets produce conceptual, logical and physical data models of a system representing the levels of abstraction in database design and data modeling. Physical model lets to represent the physical schematic of a database, conceptual and logical data models give the representation of databases on the level of tables. 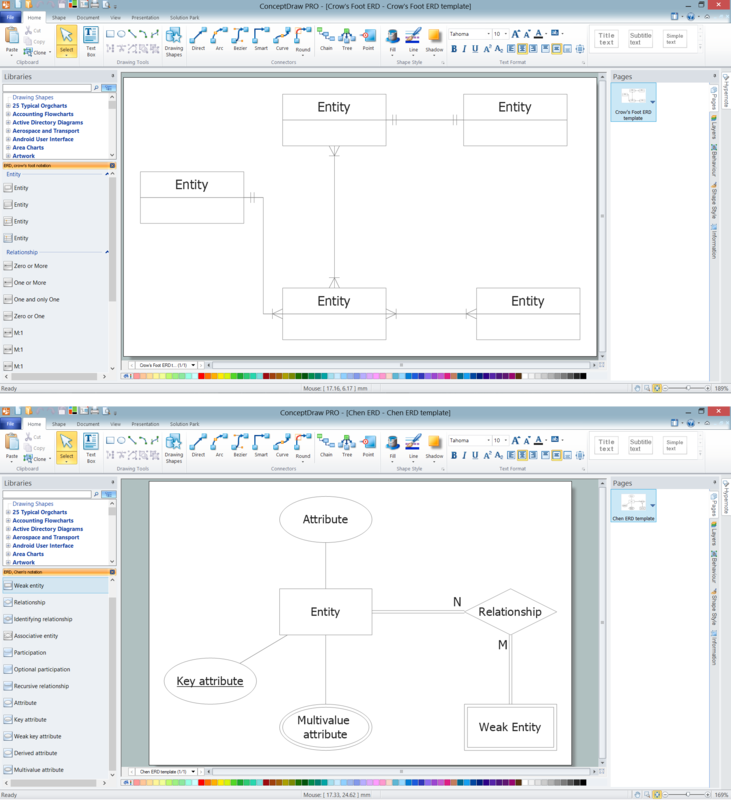 The best ERD tool for the Mac and Windows is ConceptDraw DIAGRAM software extended with the Entity-Relationship Diagram (ERD) solution from the Software Development Area for ConceptDraw Solution Park, which is sharpened for professional ERD drawing and data modeling with Entity Relationship Diagram. 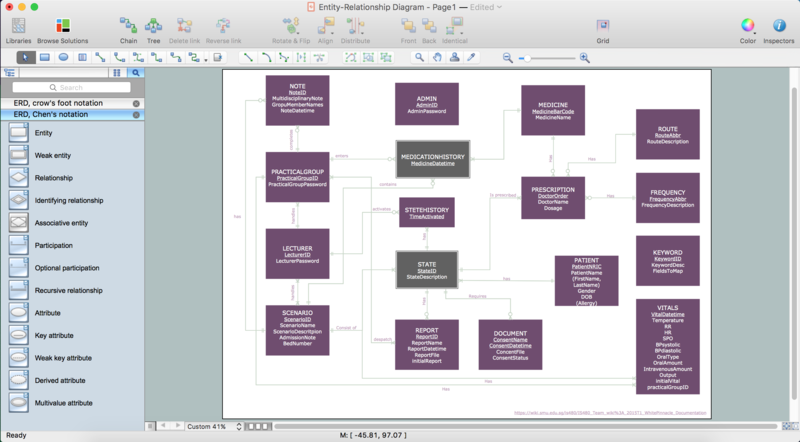 Entity-Relationship Diagram (ERD) solution for ConceptDraw DIAGRAM has examples, samples and templates, and 2 libraries with numerous quantity of vector objects for fast and easy data modeling with Entity Relationship Diagram. 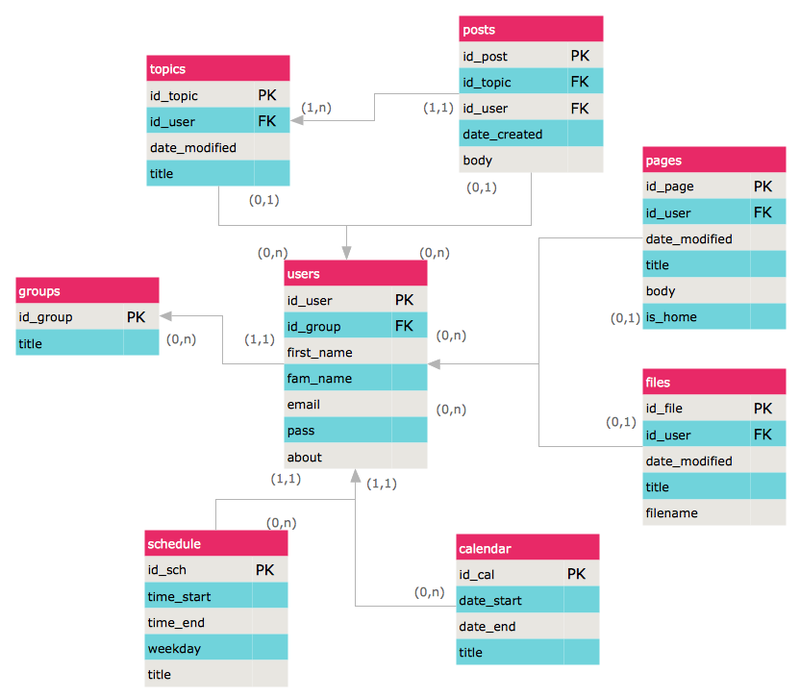 The vector graphic Entity Relationship Diagrams designed in ConceptDraw DIAGRAM to visualize the logical structure of databases can be a perfect accent for whitepapers, presentations, datasheets, posters, or any technical materials. The samples you see on this page were created in ConceptDraw DIAGRAM using the libraries from Entity-Relationship Diagram (ERD) Solution and demonstrate the process of data modeling with Entity Relationship Diagram. An experienced user spent 10-15 minutes creating each of these samples. Use the Entity-Relationship Diagram (ERD) Solution for ConceptDraw DIAGRAM software for quick, easy and effective drawing ER diagrams and data modeling.